Pest description and damage The Douglas-fir twig weevil is a small, wingless, grayish-black beetle with white markings and sometimes pinkish spots. The larvae mine under the bark or inside twigs. Infested twigs and small branches often turn a reddish-brown and die back. 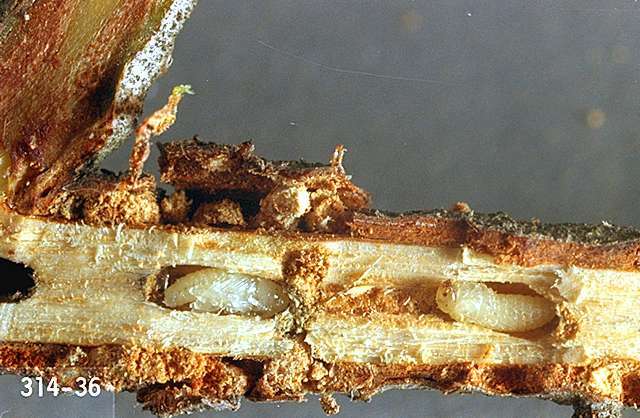 Small, stressed trees, and those in Christmas tree plantations, are especially susceptible to attack by the weevils, particularly in dry years. There are several related species on pine and true fir. 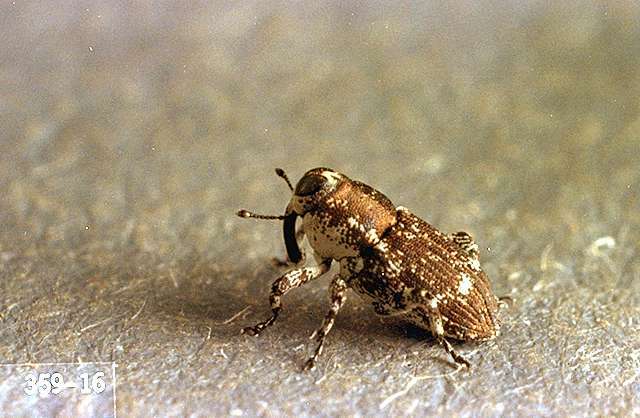 Biology and life history The weevil overwinters as a larva or adult. Adults emerge from June through early August. They lay eggs in twigs during the summer. The larvae feed by mining just beneath the bark and pupate at the ends of the galleries the following spring. There is one complete generation per year and a partial second. Pest monitoring Watch for wilting or reddish brown twigs and branch tips of small branches. Pick off adults if seen. Remove and burn infested twigs before adults emerge. Keep trees healthy with proper cultural practices, as healthy trees can better withstand insect damage.